Now what’s so special about a boat steering wheel that we would even consider a piece about it? Well, think about it for a second. In car, unless you are talking about F1 cars, a wheel is a wheel. They are more or less the same size and as exciting as a bag of nuts – (pecans or walnuts). But in a boat… in a boat it’s different – Quite different actually. When someone shows imagery that represents a car it’s usually some kind of example of a rim with a tire or a piston. Sometimes it’s a grille or something along the lines of a key or side profile of the car itself. But when it comes to boats, apart from a sail, anchor or propeller, what’s the most used piece of imagery of a boat, sailboat or ship? Of course, a steering wheel! Most of the time it’s an image of one of those huge upright wooden ship wheels with the studs that extend out. Yes, like the type seen on old frigates or in pirate ship movies. Go to any marine-themed restaurant and you’re bound to find some kind of ship steering wheel hanging from the wall somewhere. We’re happy to bet on that too. Thing is, believe it or not, boat steering wheels are exciting and unique things. Just take a look at some of the photos. A little 15 footer Boston Whaler will have a small stainless steel steering wheel with 6 or so spokes. Small maybe, but still considerably bigger in diameter than a standard steering wheel in a car. 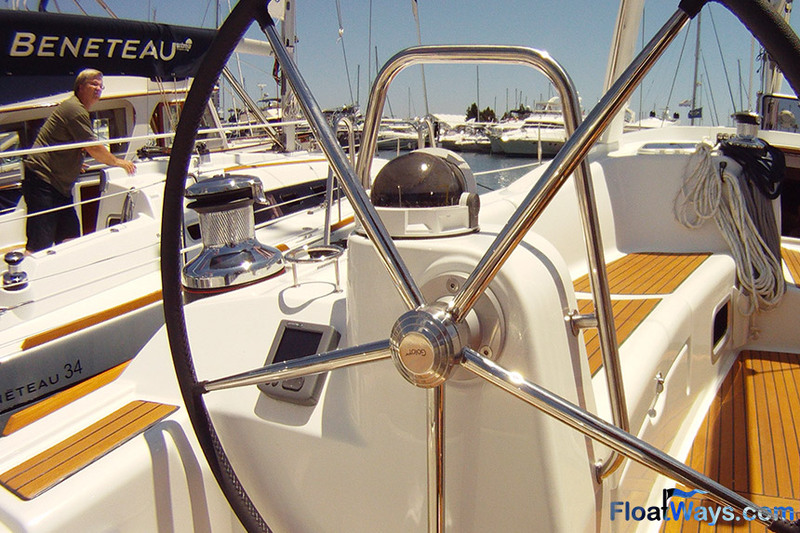 Scale that boat up to the size of a nice cabin cruiser or sport boat and the boat’s steering wheel will likely get smaller! So really, not always does the size of the boat match the size of its steering wheel. 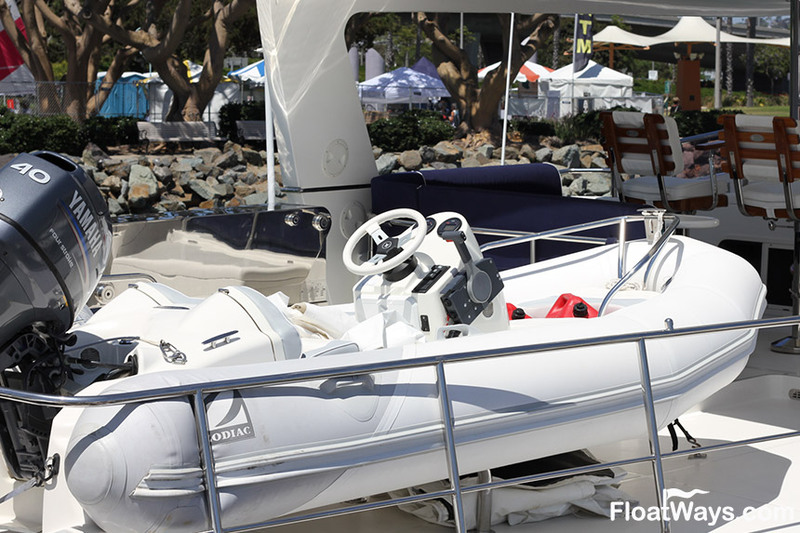 Many sport and cruising powerboats take design cues from cars, and the small steering wheel is great indication of that. However, once you go into the realms of yachts or sailboats things get a bit different. The steering wheel in some motor yachts is still quite small when compared to the sheer size of the boat, but some wheels get substantially bigger. Some even have that big steering wheel knob on them that screams “school bus!” And even more exciting is that many yachts have various levels, which means they might have a helm with a wheel in the high decks of the flying bridge and another in the dry confines of the cabin. Wood grain steering wheels are not popular in cars anymore, but yacht designers still spec them on boats so you are bound to see a lot of those. 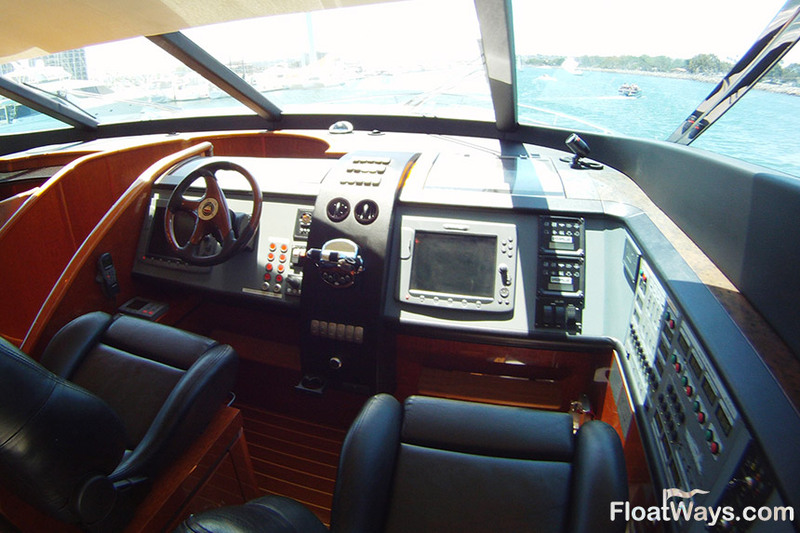 Large 80 Foot Scirocco Sunseeker yacht with a steering wheel no bigger than a car's. 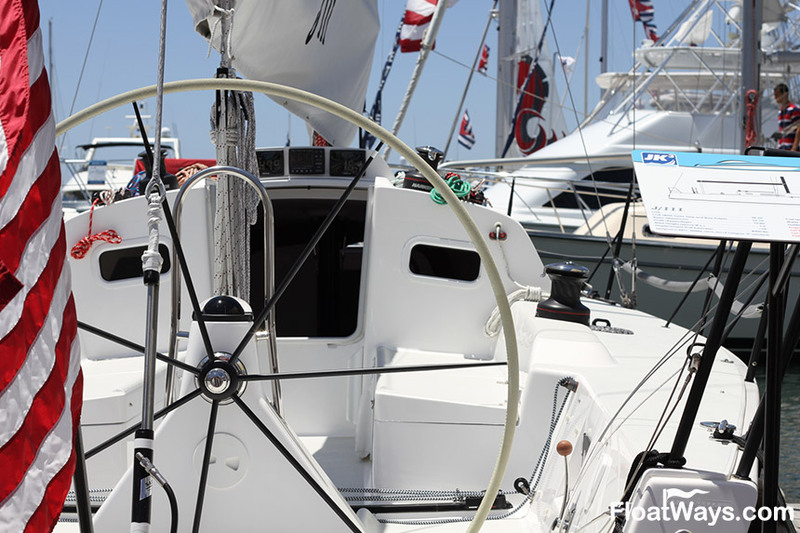 When it comes to sail power, a sailboat steering wheel can be so large that it spans almost the entire stern of the boat! That’s so that on either tack, the skipper can sit on the high side of the boat and still be able to use the same wheel. Plus, it allows the helmsman to extend out and look at the sails while still having one hand on the wheel. Furthermore, some large rudders need lots of leverage to turn. No hydraulic boat steering means a large wheel is crucial for that much needed leverage. For that reason, boats that need lots of leverage have steering wheels as big as a prepubescent teenager. Now try fitting one of those in your living room as décor! Staying on the subject of sailboats, and more specifically high-performance racing boats at America’s Cup level have two wheels, one on each side. That way, when the boat switches tacks, the helmsman can move up to the high side and use that wheel. Some of the high-performance sailboats substitute the traditional use of stainless steel or wood for their steering wheels in favor of super-lightweight carbon fiber. Just like in other sports like cycling, the purpose is to add stiffness while saving weight. Another large steering wheel aboard a race-ready J111 sailboat. Oh, and don’t forget that while many sailboats have a wheel, some are fitted with a tiller instead. This is typical in many smaller boats but is also very common in racing sport boats such as the J80, Melges 24, Flying Tiger FT10 and Columbia 30 Sport Yacht among many others. Tiller sizes are also very proportionate to the leverage needed. Larger boats that need more leverage to steer will obviously have a longer tiller. A benefit of a tiller is often that no console is needed and therefore it can often be considered a space saver. On the downside, that leaves no place to put the compass close to the helmsman. Additionally, the space savings is more perceived than real since the area around the tiller must be left open anyway to allow for the tiller’s swing from one side to the other. Even inflatable dinghies get creative with their steering wheel setup. Nowadays for performance and luxury motorboats, simple steering wheels are still predominant. However, sophisticated boat steering wheel designs are becoming more common. 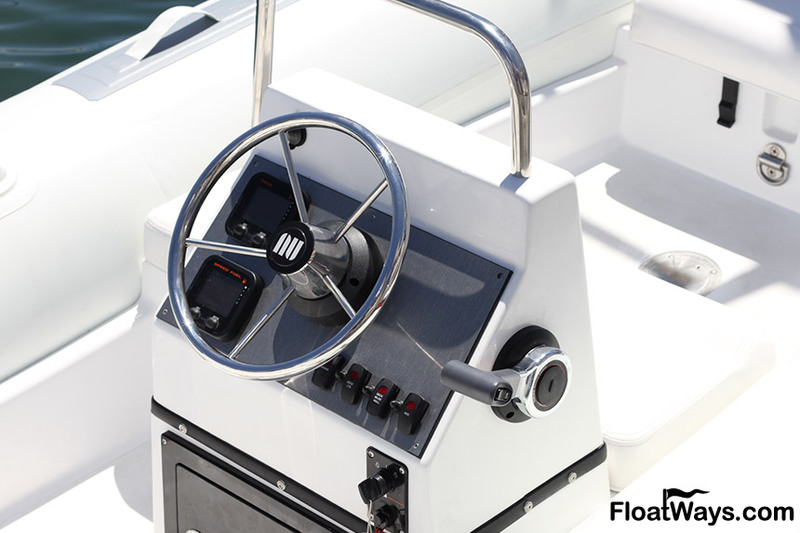 For example, on a bass boat, owners will often fit engine trim controls on the wheel itself to avoid having to move a hand off the wheel at high speeds. Learn more about this in our bass boat accessories article. 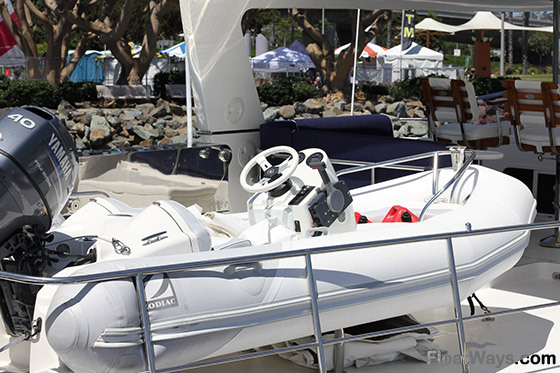 Other types of boats that will often have high-tech looking steering wheels are wake and ski boats. However, a brief discussion with 3 time Wake Surfing World Champion, Bri Chmel revealed that most wake boats don’t have electronic controls on the steering wheel. (A great suggestion she was quick to point out to the folks at Centurion Boats.) Maybe it’s now something we’ll start seeing in newer wake and ski boats in the near future. 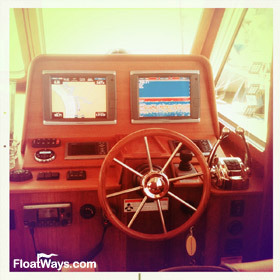 Standard stainless steel steering wheel in a small center console boat. When you started reading this article you probably thought, “What’s so great about a boat steering wheel anyway?” Well, now you know! …A lot more than you originally thought!